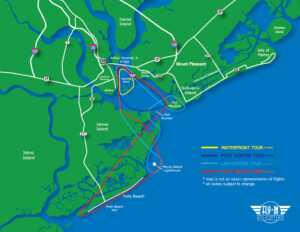 Affordable Helicopter Tours in Charleston, SC. Tickets are available at the Patriots Point ticket windows. We advise all customers to purchase their tickets when they arrive for their tour. Walk-up helicopter tours are offered from 10am – 5pm* daily (weather permitting). *or until all ticketed flights are completed. 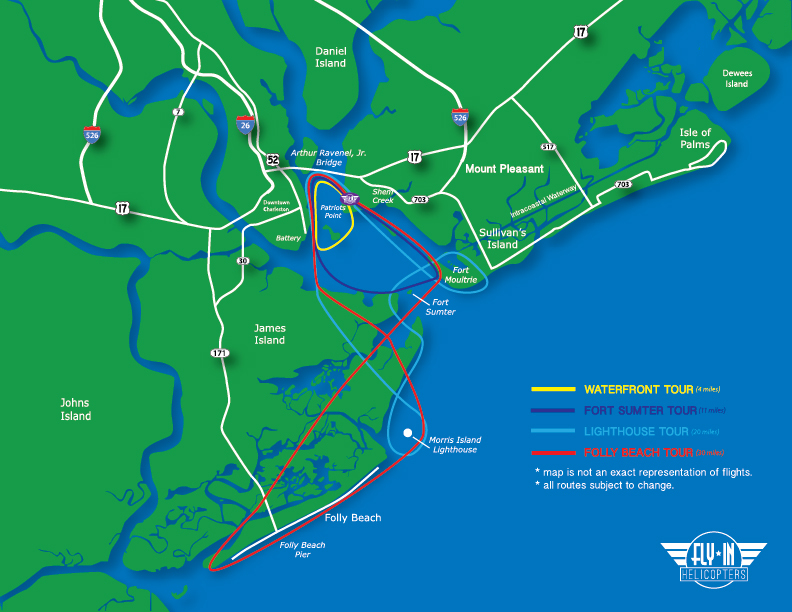 Lighthouse Tour $95/person – loop around local lighthouses and Charleston Harbor. See map below for standard helicopter tour routes. No reservations available for walk-up tours. Purchase tickets at Patriot’s Point ticket window or online. A minimum of two tickets must be purchased per flight. Strict weight limits apply. Tours are only offered weather and maintenance permitting. Online ticket sales are recommended for use as gift certificates. Due to uncertainty of weather and maintenance schedule we recommend that customers purchase tickets at Patriots Point if they are visiting Charleston for a limited amount of days. Have questions? Call 843-373-8011 or Check out our FAQs on our ‘about us’ page. Book a 30 min custom tour for $185/person. Tour routes can be custom suited to your preference. Call or email us to ask about proposal ideas, photo flights, and other special occasion tours.